At first glance it looks quite similar to the skull of a small dog or fox, but the muzzle area seems a bit short, the braincase too small and the teeth aren’t quite right for a canid – in fact the teeth look more like those of a mustelid (as Jake pointed out). 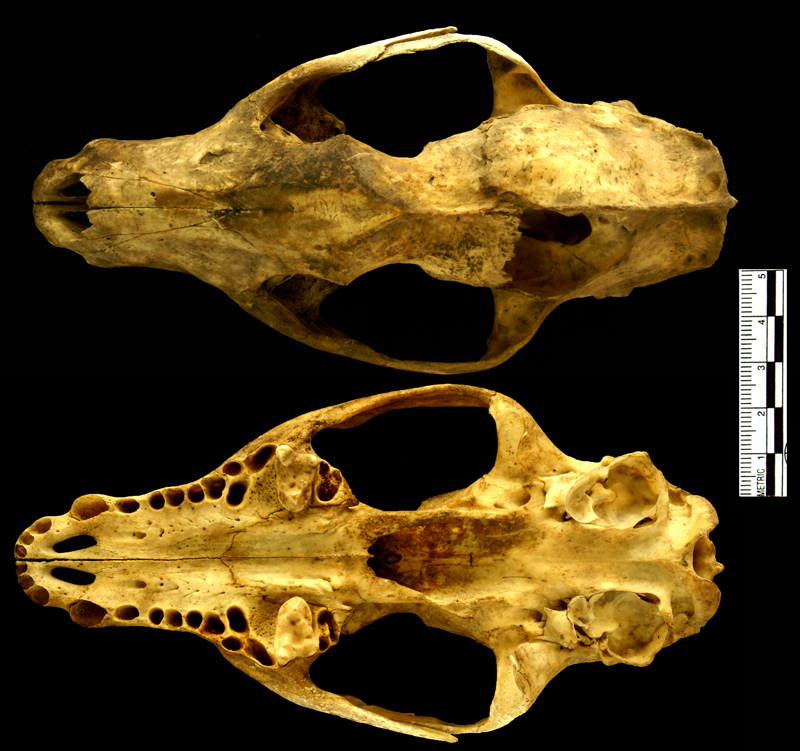 However, mustelids tend to have quite broad and blocky skulls and this one seems a bit elongate and gracile. So it looks like this is the skull of a viverrid. There are still lots of candidates out there and location could help narrow down possible species, but without any labels it can be hard to work out locality information. However, last week’s object was from the same collection and it was an African species, suggesting that Africa would be a good place to start looking for a species match. Jamie Revell did just that when he suggested the Giant Forest Genet Genetta victoriae, which is a viverrid of about the right size from Africa. Although I already thought I knew what the specimen was, I took Jamie’s suggestion very seriously, as I hadn’t considered that particular species and it fit with most of the features of the specimen. In the end an online French viverrid identification resource I’d not seen before provided me with the information I needed to exclude the Giant Forest Genet. Mainly it came down to whether the premaxillary bones made contact with the frontal bones – they do in the Giant Forest Genet, but they don’t in this specimen. Also, the area where the temporalis muscle attached is too narrow in this specimen. In light of these observations and with reference to specimens in the Horniman’s collections (including one that I used as a mystery object a year ago) I am fairly confident in identifying this as an African Civet Civettictis civetta (Schreber, 1776). It’s always satisfying to be able to make an identification of a previously unidentified specimen, but there is always a sense of caution in the back of the curatorial mind about the identification process – after all, mistakes do happen. That’s one of the reasons I continue to run this blog – the input of other commentators gives me a useful way of testing my own thoughts and that is something very valuable. In light of this I am going to reassess the identification of Pig from the mystery object a few weeks back – I am more and more convinced that it is indeed a Sheep. I’d like to say a big ‘thank you’ to all of you who comment on the Friday mystery object – your input is much appreciated! great! It was the first time I read your blog and I really like this mystery object series! I will keep following you! Glad you liked it! I hope the future objects are as enjoyable! https://polldaddy.com/js/rating/rating.jsHi. I have an interesting skull that I’d love to have help identifying. Please let me know how I can go about posting pics for you all to check out. Hi Nikki, you can drop me an email to p.viscardi at gmail dot com!